1. 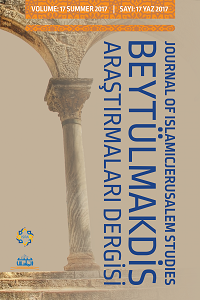 The publication language of the Journal of Islamicjerusalem Studies (JIJS) is English, Arabic and Turkish. 2. The submission has not been previously published, nor is it before another journal for consideration (or an explanation has been provided in Comments to the Editor). 4. Papers presented at conferences may be published provided that necessary explanations are made. 5. The submitted article must be in accordance with the research and publication ethics (see our ethics and malpractice statement). 6. The submitted article to JIJS will be sent to a minimum of two reviewers who will be evaluated by the "double-blind review" method. 7. In case of different opinions of two referees, a third reviewer shall be consulted. The paper is published if at least two reviewers give a positive report. The reviewers reports will be available to the author(s). 8. References should follow the 6th Edition APA System (Author-date system). For Arabic article, we accept endnote style citation. 9. All submitted article should include English language bibliographic information, including Titles, Abstracts, Keywords and Cited references. In addition, the author must provide references in Roman script. 10. The copyright of the articles published in the journal is deemed to have been transferred to the Journal of Islamicjerusalem Studies.